Each slab is unique & a tiny masterpiece. Veins, patches of colour & crystals, combined in a design that was planned by nature millions of years ago. The Marble Warehouse offers you the opportunity to visit its stone yard to select the slab for your worktop yourself - this is definitely worth taking advantage of - especially if you are considering a particularly unusual granite. You will be able to see its individual markings before you buy. Polished finishes reflect light best, so even dark colours can work well in relatively small kitchens. This coupled with the fact that they require little ongoing maintenance means they tend to be the most popular preference. 'Natural Stone' - few of the materials that are part of our everyday life have such an ancient history. More than Ten Million years ago, when the earth was still being moulded into the world we know today, stone materials were formed into what today are often considered real works of art due to their natural beauty and unique qualities. Observing the creations of nature in their raw original form, its hard to imagine the same materials as the beautiful forms we are used to finding in our homes and cities. Before being put on show, each natural stone must go on a long journey. Each journey starts in one of the many quarries around the world. The material is cut away from the mountain and into rough blocks of varying sizes, depending on the characteristics of the material. 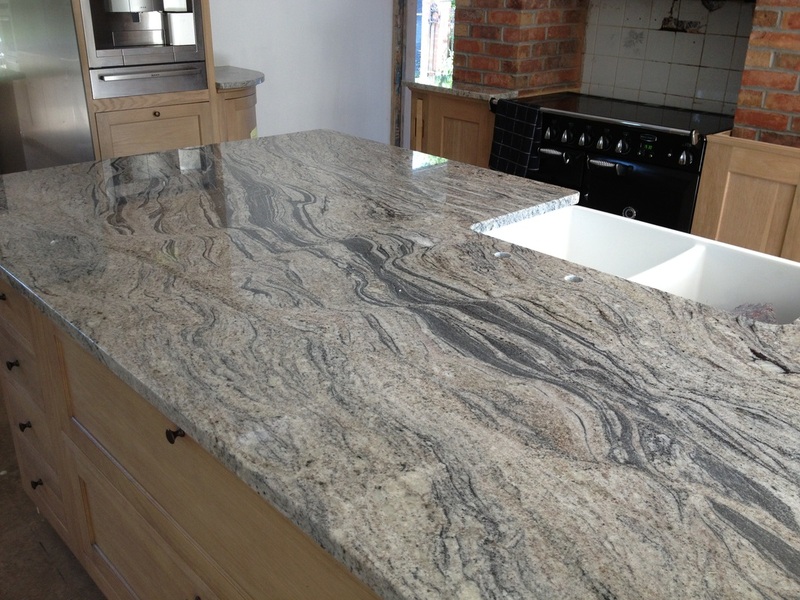 1 m³ of granite weighs an average 2.7 tonnes and an average sized block can weigh up to 24 tonnes. The blocks are cut into slabs a few centimetres thick to be manageable for their following processes. In this phase, only the expert eye can understand the structure of the material that's just arrived from the quarry. Enormous frames with dozens of blades work for several days to cut a block of granite. The speed of the cut varies depending on the material and in a block of granite this rarely exceeds 3cm an hour. After cutting, the slabs are finished to give the material the appearance we are used to seeing, polished, sanded & flamed (Usually Polished). The slabs are polished and faced under a series of planing machines to eliminate all of the imperfections on the material, bringing out the colour and design. Only after this process is it possible to admire the design and colours created by nature in all their beauty. Sometimes it may be necessary to soak the slabs in a resinous substance to make them stronger and fill the small holes that can form when the material is worked. This process enhances the colour of the material even further. After these phases, the material is ready for the final cutting and installation, whether kitchen worktops, vanity tops, tables or tiles, the upstream processes used to create these products are more or less the same. Small variations are necessary to adapt to the incredible variety of materials available in nature, from marble, made from mostly calcium and relatively soft to work with, to limestone, up to granite & quartz - Highly resistant materials that are very hard to cut and work. Natural stone is one of the most environmentally friendly materials used in construction. The extraction doesn't involve an enormous waste of energy or the production of toxic waste or effluents. Furthermore, the total absence of chemical products or toxic substances makes them absolutely compatible with our living space. Natural stone, while worked by man is really an exclusive creation of nature. Each slab is a tiny masterpiece, a piece of the earth's geological history. Veins, patches of colour, crystals combined in a design that was planned by nature millions of years ago resulting in a truly unique product in today's times where mass produced products all exactly the same are everywhere. Man has only contributed to this work of art by adapting the forms to meet his requirements, at the same time enhancing the beauty of the material. Each product is truly unique. Blocks with a uniform colour and design can be extracted from the quarry, but at the end of the process each slab is unique, just like the work of an artist.